The Cabinet of Ministers of Ukraine has approved bill No. 9000 on the national budget of Ukraine for 2019 for second reading at a meeting on Wednesday, instructing to review it within three days. 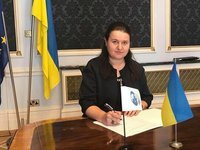 Acting Finance Minister of Ukraine Oksana Markarova said that the deficit of the budget remains at 2.3% of GDP. She said that the revised bill takes into account changes in revenues, in particular, in accordance with bill No. 9260 adopted by parliaments on raising a number of royalties and excise rates. The document also takes into account the expected income from the legalization of cars with foreign license plates in accordance with the adopted changes in the legislation. At the same time, Defense Minister Stepan Poltorak said that the budget financing in the defense sector is insufficient. "Financing does not allow us to fully purchase the necessary equipment," he said. Prime Minister of Ukraine Volodymyr Groysman said that the draft budget envisages financing of the defense sector at 5.3% of GDP, although legislation provides for a lower limit of 5% of GDP. Earlier, Chairman of the Verkhovna Rada Andriy Parubiy said that the parliament would consider the bill on the national budget for 2019 on Thursday, November 22.